Whether united under the leadership of a mighty warlock or having fought to a standstill after years of conflict, orc and human tribes sometimes form alliances, joining forces into a larger horde to the terror of civilized lands nearby. Some half-orcs rise to become proud chiefs of orc tribes, their human blood giving them an edge over their full-blooded orc rivals. Some venture into the world to prove their worth among humans and other more civilized races. Many of these become adventurers, achieving greatness for their mighty deeds and notoriety for their barbaric customs and savage fury. Half-orcs’ grayish pigmentation, sloping foreheads, jutting jaws, prominent teeth, and towering builds make their orcish heritage plain for all to see. Half-orcs stand between 5 and 7 feet tall and usually weigh between 180 and 250 pounds. Orcs regard battle scars as tokens of pride and ornamental scars as things of beauty. Other scars, though, mark an orc or half-orc as a former slave or a disgraced exile. Any half-orc who has lived among or near orcs has scars, whether they are marks of humiliation or of pride, recounting their past exploits and injuries. Such a half-orc living among humans might display these scars proudly or hide them in shame. The one-eyed god Gruumsh created the orcs, and even those orcs who turn away from his worship can’t fully escape his influence. The same is true of half-orcs, though their human blood moderates the impact of their orcish heritage. Some half-orcs hear the whispers of Gruumsh in their dreams, calling them to unleash the rage that simmers within them. Others feel Gruumsh’s exultation when they join in melee combat, and either exult along with him or shiver with fear and loathing. Half-orcs are not evil by nature, but evil does lurk within them, whether they embrace it or rebel against it. Beyond the rage of Gruumsh, half-orcs feel emotion powerfully. Rage doesn’t just quicken their pulse, it makes their bodies burn. An insult stings like acid, and sadness saps their strength. But they laugh loudly and heartily, and simple bodily pleasures—feasting, drinking, wrestling, drumming, and wild dancing — fill their hearts with joy. They tend to be short-tempered and sometimes sullen, more inclined to action than contemplation and to fighting than arguing. The most accomplished half-orcs are those with enough self-control to get by in a civilized land. Your Strength score increases by 2, and your Constitution score increases by 1. Half-orcs mature a little faster than humans, reaching adulthood around age 14. They age noticeably faster and rarely live longer than 75 years. Half-orcs inherit a tendency toward chaos from their orc parents and are not strongly inclined toward good. 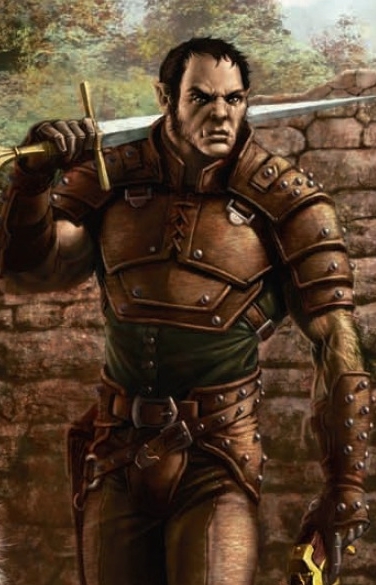 Half-orcs raised among orcs and willing to live out their lives among them are usually evil. Half-orcs are somewhat larger and bulkier than humans, and they range from 5 to well over 6 feet tall. Your size is Medium. Thanks to your orc blood, you have superior vision in dark and dim conditions. You can see in dim light within 60 feet of you as if it were bright light, and in darkness as if it were dim light. You can’t discern color in darkness, only shades of gray. You gain proficiency in the Intimidation skill. You can speak, read, and write Dani and Olog-hai. Olog-hai is a harsh, grating language with hard consonants. It has no script of its own but is written in the Aarnath script. A half-orc typically chooses a name that helps him make the impression that he wants to make. If he wants to fit in among humans, he chooses a human name. If he wants to intimidate others, he chooses a guttural orc name. A half-orc who has been raised entirely by humans has a human given name, but he may choose another name once he’s away from his hometown. Some half-orcs, of course, aren’t quite bright enough to choose a name this carefully. Orc Male Names: Dench, Feng, Gell, Henk, Holg, Imsh, Keth, Ront, Shump, and Thokk. Orc Female Names: Baggi, Emen, Engong, Myev, Neega, Ovak, Ownka, Shautha, Vola, and Volen. 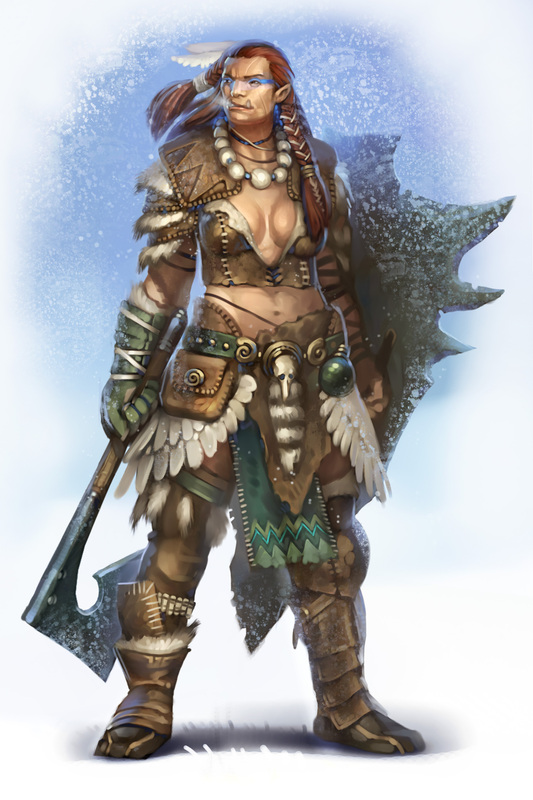 Half-orcs most often live among orcs, which can be found in any harsh mountainous terrain that humans tend to consider uninhabitable; most notably within the Icehorn Mountains. Of the other races, humans are most likely to accept half-orcs, and half-orcs almost always live in human lands when not living among orc tribes. Whether proving themselves among rough barbarian tribes or scrabbling to survive in the slums of larger cities, half-orcs get by on their physical might, their endurance, and the sheer determination they inherit from their human ancestry.